The last day to order a plated part and have it shipped before Christmas is Tuesday, December 11th. The last day to order for shipment before Christmas is before noon on Tuesday, December 18th. 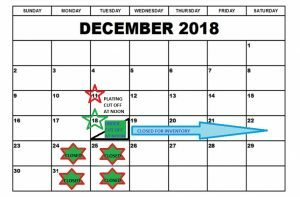 We will be closed for inventory beginning Wednesday, December 19th and not reopening until Wednesday, December 26th. Orders (with no plating) received before noon on Friday, December 28th will ship and invoice in 2018. 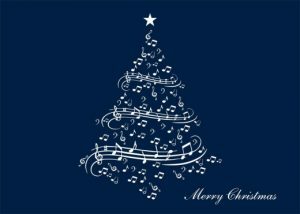 Our technician support is also disrupted during the holidays as Craig and Beth, two of our most experienced and valued employees take holidays that overlap a bit – they deserve it!! Please get your technical questions in before Christmas or you may wait to have it answered until January. We will be closed to celebrate the New Year on Monday, December 31st and Tuesday, January 1st, reopening at 8 am on Wednesday, January 2nd. Please keep these dates and holiday hours in mind as you prepare to close up your year. Always good to remember that shipping times vary wildly during the month of December as well. If you absolutely need a part please consider paying for expedited shipping and handling … the one to two-day shipping average cannot be counted on during the e-commerce shopping season. As always, everyone at Allied wishes you a safe and blessed holiday season!